From its embodiment of classic Southwest desert landscapes to the subtle quirks that define its cultural identity, there’s no question of Tucson’s beauty. 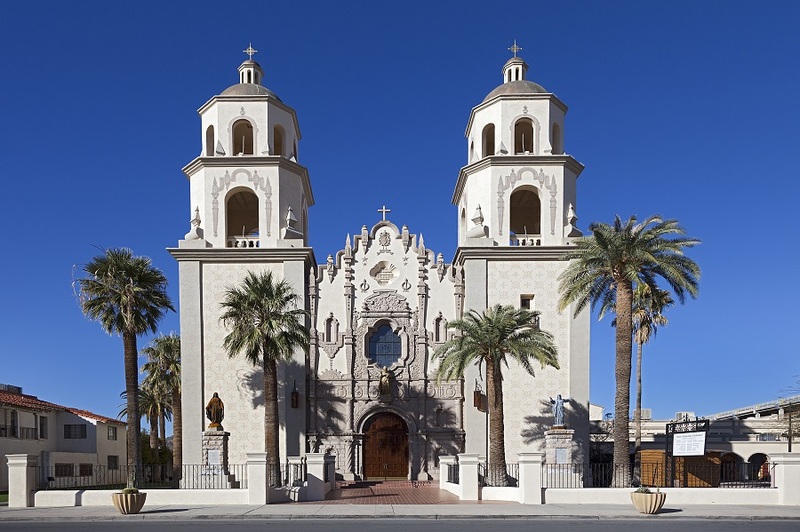 It comes as no surprise that history buffs often find themselves roaming the town, getting lost between buildings twice their age, as Tucson architecture is as bright and refreshing as it is classic. The following guide, though not all-inclusive, will serve as a good starting point for the imaginative, requiring only a few hours on a lazy day of your choice, a nice post-tour picnic, and your camera. MacArthur Building: Once a luxurious hotel, the MacArthur Building has earned a spot on the National Register of Historic Places. It was conceptualized by architects, Holmes and Holmes, and is notable for its triangular shape which is only evident from a bird’s eye view or nearby street corners. Scottish Rite Cathedral: This masonic temple was erected in 1915 and claims 35-foot hand-carved ceilings, over 15,000 square feet of space (often reserved for weddings), and classic architectural style that is nothing short of majestic. The Cathedral of Saint Augustine (Shown): Perhaps the most architecturally elaborate of the sites and a definite must-see, the Saint Augustine Cathedral is rich in history with roots dating back to 1858. It features stone designs of Pope Pius XI along with yucca blossoms. A walk inside will lead you to a large crucifix carved in Pamplona, Spain, around the 12th to 13th century. La Placita Village: This part of the tour will likely be the most fun as the village exudes a Mexican market style vibe while offering a colorful addition to a contrastingly modest collection of Tucson architecture. Shop or grab a bite to eat as you take in the Spanish style multi-level structures. As an added bonus, visit the picturesque gazebo that dates back to the 1800s. Pima County Courthouse: While courthouses don’t exactly conjure up ideas of notable sightseeing, this one is certainly worth a visit. Standing as 1928’s main county courthouse, the building features styles of the Spanish Colonial Revival and Mission Revival. Corbett House: According to the Tucson Museum of Art, this “elegant two-story, stucco-covered brick structure [was] built in the Mission Revival style [and was] completed in 1907.” It was named after its residents, J. Knox Corbett and family, and holds historical significance as a meeting place for city clubs of its time. Fun fact: the attic was used for gin manufacturing during prohibition. Steinfeld House: This historic estate is reminiscent of Tucson’s most affluent residents of the early 1900s. It was developed in Mission Revival style and includes Southwest style arches, tile roofing, and a shaded courtyard that allows present-day museum visitors to admire its beauty. Levi H. Manning House: In a marriage of Spanish Colonial and Santa Fe styles, this downtown home once belonged to the Mayor of Tucson. Manning is said to have been Tucson bound at the advice of his mother after wild antics with some fraternity partners resulted in a circus elephant running rampant through his hometown. If you’re familiar with the Tucson area, you shouldn’t have any trouble navigating these aesthetically rich buildings. However, out-of-towners and those a bit more directionally challenged would do well to consult a digital guide such as www.gpsmycity.com. The site’s free app (available on iOS and Android) brilliantly offers turn-by-turn directions without the need for Wi-Fi. And there you have it. Lace up your comfortable tennis shoes and grab your family or significant other for a unique date chocked-full of hand holding and picture taking as you explore breathtaking gems of the Tucson architecture scene.